Don’t mess with success. Well, not too much. Take a good look at it and you’ll soon see the differences between the all-new 2019 Porsche Cayenne and its immediate predecessor. 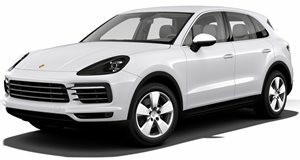 Making its live debut here at the 2017 Frankfurt Motor Show, the third generation Cayenne is already bound to be a smashing sales success, hence Porsche’s wise decision to make this a truly evolutionary design. What strikes us most is the roofline. Notice that it’s flatter and less “bubbly.” This was done purposely to emphasize the Cayenne’s sports car-inspired origins, as opposed to the typical SUV rounded roofline. Two engines will be initially on offer in the US: a turbocharged 3.0-liter six-cylinder with 340 hp and 332 lb-ft of torque, or, for the Cayenne S, an optional 2.9-liter twin-turbo six-cylinder with 440 hp and 406 lb-ft. Both are paired to a new eight-speed Tiptronic S gearbox. Performance? Try 0-60 mph in 4.9 seconds. Tack on the optional Sport Chrono Package and you’ll rocket the quarter-mile sprint in just 13.2 seconds at 164 mph, up from 14.2 seconds and 152 mph. And because Porsche wants owners to be able to take their Cayennes almost anywhere, it has four off-road modes: Mud, Gravel, Sand, and Rocks. Putting the Cayenne on a diet was also a main factor, and Porsche managed this weight loss with a healthy diet of a new lightweight chassis, a mixed alloy and steel body, and an exterior made nearly entirely of aluminum. All told, that’s 143 pounds removed right there. Even the new lithium-ion starter battery weighs 22 pounds less than before. Also really interesting is the fact that Porsche opted to make a major chassis design change: a separated link design for the front axle and a multilink rear axle, resulting in staggered front and rear tire sizes, measuring either 19 and 21-inches, or 20 and 21-inches. The interior is typical Porsche, now featuring a large 12.3-inch full-HD touchscreen. Many of the old buttons are now gone, having been integrated into the touchscreen. The driver also benefits from two seven-inch HD displays in the gauge area. Sales of the 2019 Porsche Cayenne will kick off in mid-2018, with pricing beginning at $65,700.